My family arrived in California from Louisiana in the 1940’s. Like so many other families, my ancestors had to move to find opportunity and hope. Think of the Great Migration of six million Black people out of the South in the 20th century, or the 2005 exodus of Black folks from New Orleans after Hurricane Katrina. Being uprooted is part of the human experience, which is why so many of us are so moved by the plight of immigrants today. Whether they come from Mexico, Central America, Africa, Asia or anywhere else, immigrants often are escaping places where they can’t make a living and raise their kids, places that are unsafe, places where they can’t envision a better future. Yet, immigrants in our state and across the nation face unprecedented levels of harm and hate. The Trump administration’s ‘forced separation’ policy is tearing children from their families. They are hunting people down to deport them, most recently through the Trump administration’s attempt to end the DACA program protecting young Dreamers, and canceling temporary protected status (TPS) for immigrants escaping natural disasters in El Salvador, Haiti, and Nicaragua. Following in the federal government’s footsteps, a handful of state and local governments are insisting on greater cooperation from local law enforcement to identify and detain undocumented residents. 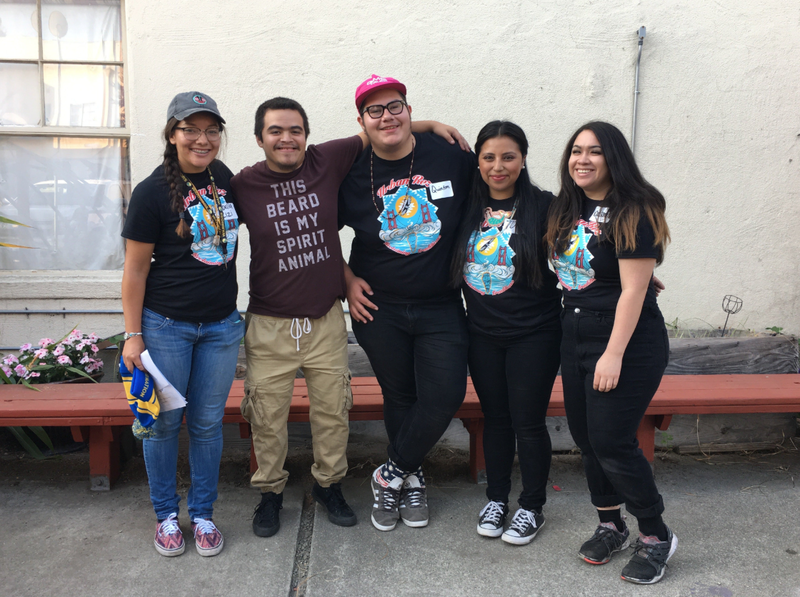 We are lifting up the work of our grant partners through a monthly spotlight series; for our May installment, we featured our Beloved Community Fund BOOST Grantee, Intertribal Friendship House. The mission of the Intertribal Friendship House (IFH) is to promote the ability of Native people to thrive in an urban environment through ceremony, traditions and cultural connections. We provide a safe environment to strengthen cultural identity, promote health and intergenerational healing, and support the development of the extended family. This is a big year for our Racial Justice Poster Project, as we mark 10 years of lifting up arts and culture to advance racial justice through our annual poster. Each year, Akonadi Foundation commissions an artist to create a poster that reflects a vision of a racially just world, commemorating March 21, the International Day for the Elimination of Racial Discrimination. In May, we marked this milestone by bringing together our 2018 commissioned artist, Joshua Mays, and past poster contributors Janine Macbeth and Robert Trujillo, for a discussion on the role of art and culture in the current political moment. Moderated by Davey D, the discussion was lively and a wonderful way to hear from participants about how they support themselves as full-time artists and how they balance creating art with life’s responsibilities. If you missed it, you can find the recorded event on our Facebook page. Many thanks to all who attended, and to Davey D, Joshua, Robert, and Janine, as well as event host, Vanessa Camarena-Arredondo. If you haven’t yet seen the poster’s ten-year retrospective exhibit, it’s not too late; you can view the installation in the street level windows of the Historic Central Building at 436 14th St. There you can find all the posters, including the very first image that kicked off the project. In 2008, Akonadi Foundation’s founder and then-President Quinn Delaney commissioned Melanie Cervantes, an artist with Dignidad Rebelde who was also a Program Officer for the foundation, to create a racial justice image to commemorate March 21, the International Day for the Elimination of Racial Discrimination. 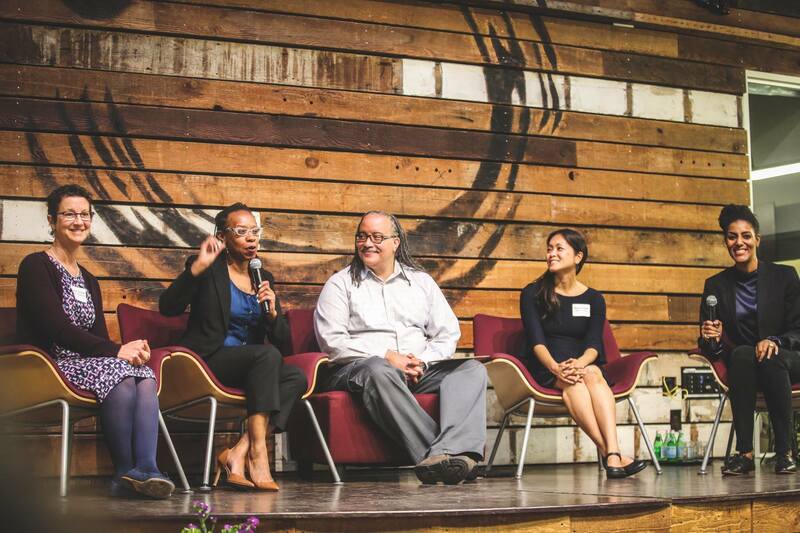 That image, ‘Building a Movement for Justice,’ inspired the launch of Akonadi Foundation’s Racial Justice Poster Project. 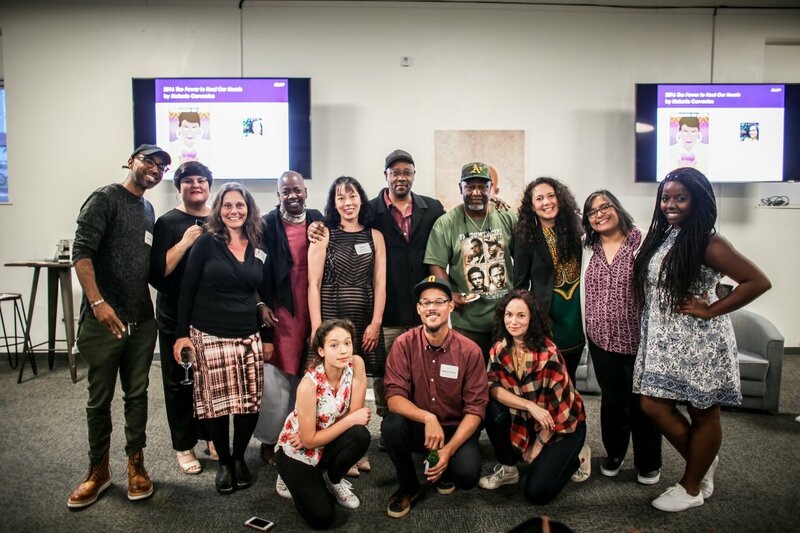 We were thrilled to co-host a gathering on May 30 of over 150 members of the Bay Area social justice philanthropy community to watch Tony Award-winning actress Sarah Jones perform “The Foundation”. This dynamic, multi-character one-person show explored the challenges facing philanthropy in the current political moment. The performance was followed by a powerful panel discussion about the needs, challenges, and opportunities integral to investing in racial justice featuring local philanthropic leaders Quinn Delaney, Akonadi Board Chair; Lateefah Simon, Akonadi President; Karen Grove, and Maria Nakae, Justice Funders’ Engagement Director. Nicole Boucher emceed the event and Ludovic Blain moderated the panel; both are from California Donor Table. We would like to extend a special thanks to the event’s co-sponsors: California Donor Table Fund, Justice Funders, Resource Generation, Women Donors Network. See the event photos here.